I have a very special book to share with you today! 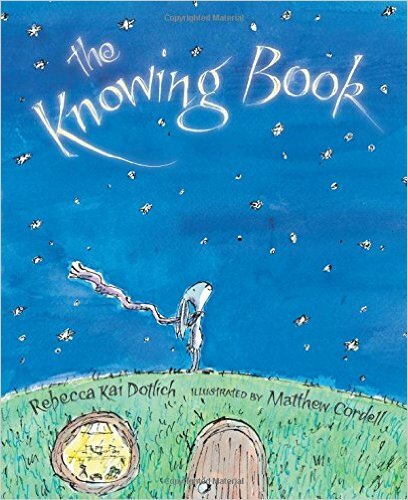 The Knowing Book by Rebecca Kai Dotlich is a book all about adventure and living life through good times and bad! We follow an adorable bunny as he walks through the earth realizing that as he looks up know matter where he is in life the sky is the same. The illustrations by Matthew Cordell are stunning and add so much beauty to this story. I think this is a great book for children perhaps dealing with moving or maybe dad getting deployed. It will help them with the emotions around change and teach them to embrace change but look for the familiar! This story begins and ends with the sky that is always above you. In between, a rabbit sets off on an adventure. He chooses a path, explores the unknown, pretends and plays and imagines. The rabbit’s journey teaches us that both a hum and a cry will bring comfort when we’re lost, and that we should keep curiosity and adventure in our pockets. There is magic all around us, but it hides – be open to it. At the end, the rabbit returns home, the place he can always count on and will always know. I will read this book with my grandson. I'll read this with my niece. I'd read it with the little ones in my extended family. This sounds like another great book that I would love reading to my grandson.